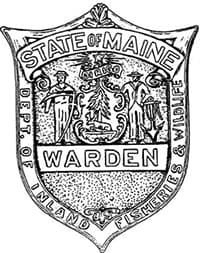 The Maine Warden Service dates back to 1880, when the founding wardens were appointed to enforce laws giving Maine's moose and deer their first legal protection. From this modest beginning, the Maine Warden Service has grown to 124 uniformed members, making it the largest of the three bureaus within the Department of Inland Fisheries & Wildlife. Decade-by-decade highlights appear below. To browse historical documents in detail, visit the MDIFW historical archives page. The service's first enforcement action occurred when, on March 12, 1880, game wardens apprehended two men for killing a doe in closed season, marking the start of a decade of uphill battles. The earliest Maine Game Wardens, who received no regular salary but instead collected half of the penalties paid by poachers, were not highly incentivized for their dangerous jobs. Two of them, one a Civil War veteran, were shot and killed by poachers they attempted to confront. Citizens feared similar retribution for reporting poachers, so Wardens largely fought these battles alone. No licenses were yet required to fish or hunt, and inhumane hunting practices, market hunting, and game exportation were all rampant. Still, in 1886, the Boston Herald called Maine's game laws "the most rigid and best enforced… of any state in the union!" Two years later, wardens seized a whole carload of caribou meat on its way to a Boston market. Around this time, the Commissioner expressed measured concerns about the caribou population. An estimated 4,000 caribou were being killed each year. In 1899, the Department, seeing a need to conserve fish and game if Maine were to have any left, enacted "The September Law." This early attempt at a hunting license program cost $4.00 for residents and $6.00 non-residents, and allowed license holders to kill one deer in the month of September. It was extremely unpopular and swiftly abolished. That same year, wardens closed the season on caribou, and found at year end that there were "practically no caribou in the state of Maine." During this time, tension emerged between the protection of species and property. In response, the state paid bounties for killing crow, bear, wolves, wildcats, and porcupines, and also reimbursed land owners whose crops were damaged by deer. At the same time, more protections were introduced, with a trapping season established for fisher, mink, muskrat, and sable, and beaver protected all year. In 1907, the sale of trout, landlocked salmon, togue, white perch, or black bass was prohibited. York County had a bucks-only law, and the "Old Sunday Law," which prohibited hunting and fishing on Sundays, was put into place, but frequently violated. People started hunting from automobiles, but the practice was banned in 1916. And in 1917, a second attempt at the rollout of hunting and fishing licenses proved more successful. Non-resident fishing licenses were offered at $2.00 each, as were lifetime resident hunting and fishing licenses, at 25 cents each. Revenue from these programs allowed the Maine Warden Service to expand. Hatchery expansion and other financial strains caused the warden service to downsize, reorganize, and raise license fees. Moose season was permanently closed, due to concerns that "when they finally disappear, they will no more return than the caribou have." Positions at the Warden Service, which now came with salaries, became more highly coveted around this time. Candidates, previously politically appointees, were now selected based on their scores on Civil Service Exams. This was the era of Commissioner Stobie, an influential and well-admired leader who once hosted a party at Moosehead for FDR's Cabinet, inviting all the east coast Governors. Under his direction, stocking and hatchery efforts were ramped up, as was enforcement, with the creation of the Aviation Division, the first pistol team, and the first Warden Academy. Stobie was also the guiding force behind the 1939 founding of the Wildlife Research Division. 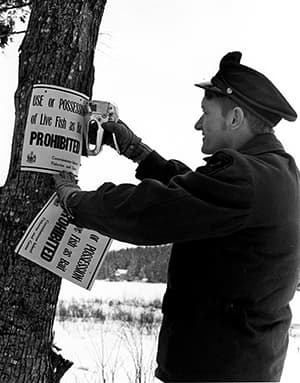 In the early 1940s, Wardens began responding to occasional lost hunter complaints; and in 1943, searching for lost people became, by law, the Warden Service's responsibility. Despite more responsibilities than ever placed on the Department, many full-time Wardens were called to serve in WWII, and were replaced for a time by Temporary Wardens. Night hunting violations and violence toward Wardens both escalated to all-time highs; and in 1949, Wardens were issued police .38 caliber revolvers. Stricter penalties finally curbed night hunting, with violations falling significantly. Meanwhile, 170,000+ licensed hunters were legally harvesting over 40,000 deer per year. Wardens' responsibilities and capabilities continued to expand thanks to technology and scientific innovation, with Wardens using 2-way radios, Warden Pilots stocking fish from above, and half the service patrolling the ground in newly-issued state owned vehicles. Gaining newfound traction toward its mission, the Warden Service was able to hire temps for hunting season and raise full-time salaries. The fleet of state-owned vehicles expanded and was given blue lights and sirens; and snowmobiles and motor boats were added to the fleet. With their increased mobility and visibility, wardens were also given more responsibilities, including enforcement of motor boat and snowmobile registration and litter laws. As search and rescue demands increased, an official Warden Service Rescue Unit was formed with mountain climbers and scuba divers. On the biology front, Wardens completed a Creel census and established a Meat Identification Lab. The Warden Service obtained Army surplus helicopters; and following a tragic incident wherein a Warden pilot survived a helicopter crash only to drown at an 8-foot depth, the department made it mandatory that all Warden School candidates be able to swim. On the hunter safety front, Blaze Orange Law went into effect statewide, PFDs were now required for watercraft, and the book You Alone in the Maine Woods was published. The Department continued to grow, and changed its name to The Maine Department of Inland Fisheries and Wildlife to reflect its full scope of responsibilities. Regional headquarters opened and the Color Guard was established, as was the Maine Warden Service Relief Association. Meanwhile, enforcement training and capabilities increased with wardens given new practical training at Swan Island, high-ban police radios, a pursuit-driving course, and access (for inspectors) to supervisor school at the Maine Criminal Justice Academy. In 1978, the Department hired Warden Deb Palman, its first female Game Warden. Search and rescue capabilities increased dramatically with the establishment of the Warden Service K9 Team, the Search and Rescue Overhead Team, and a command post. Hunting law enforcement evolved with the introduction of a turkey season, new antlerless deer restrictions, and new migratory waterfowl regulations. ATV laws were also enacted, with enforcement added to Wardens' responsibilities. The Warden Service added operational efficiencies, including the establishment of five Division Headquarters, a vehicle leasing program through Central Fleet Management in Augusta (rather than department ownership), and upgrades to trucks and handguns. Public reporting was streamlined, too, with the rollout of a 1-800 number. In the 2000s, the Department made major technological and strategic updates, and forged partnerships with private companies like L.L.Bean. One such partnership, the Outdoor Partners Program (OPP), funded a tow-behind trailer that functioned as a mobile information booth. Large enough to accommodate two wardens and hundreds of giveaways like law books, posters, and clothing items, the OPP trailer visited major outdoor events like county fairs, fishing derbies, etc., and connected Wardens with the public in a friendly, fun non-law-enforcement context. In another on-the-road improvement, Warden trucks were equipped with Mobile Data terminals so wardens could run inquiries, write reports, and use mapping software out in the field. The Department also digitized its record-keeping and reporting with several new systems, including RMS, the record management system used by the Maine State Police; WSAR, an online electronic reporting system that eliminated handwritten reports; and MCRS (the Maine Crash Reporting System), which was expanded to include not just vehicle crashes but also ATVs and snowmobiles. With this change, the Maine Warden Service Evidence Recovery Team (ERT) was also established. In 2012, Maine Warden Service partnered with Animal Planet to create North Woods Law, a TV series that documented the day-to-day life and work of Maine Game Wardens. The bureau's goal for the series was to create local and national public awareness, and with it, a new class of strong and passionate Maine Game Warden recruits. After four years, the series more than delivered on that goal, and the fully-staffed warden service filmed its final season. In 2015, the Warden Service joined the entire Department of Inland Fisheries and Wildlife in a comprehensive marketing and branding exploration. Several insights were uncovered, including a desire to present a more united public image, together with all the biologists, educators, and staff of MDIFW, and together build on the success of programs like OPP and North Woods Law. In 2016, the Warden Service replaced its tagline, honoring the past, cherishing the present, planning for the future, with a cohesive department-wide one: All In for the Maine Outdoors. And today's Game Wardens truly are all in — working tirelessly throughout the state in all conditions, using modern technology and techniques to carry out responsibilities ranging from law enforcement to education to angler surveys, fish stocking, search and rescue efforts, and more. For more information on today's Maine Warden Service, visit our about, organizational structure, and specialty teams pages. And for more on some of the departments proudest honors and most honorable members throughout the years, visit our recognition/awards and fallen heroes/honor roll pages.